The humble potato cake originated from Ireland. Traditionally cooked in a cast iron pan over an open turf fire, the potato cake was a cheap filling and tasty dish. Finely chopped cabbage and milk were added for extra nourishment and the cakes were cooked in bacon fat or butter. Potato cakes were also eaten in Scotland and some Northern counties before becoming popular elsewhere. This simple dish is enjoyed all over the world-in some form or another. 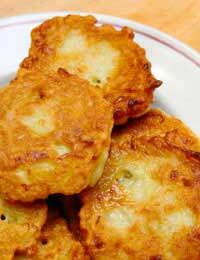 Other names used include ‘tattie scones’ or ‘potato patties’ (scalloped potatoes in Australia) but potato cakes are not the same as hash browns. Sift the flour with the salt into a mixing bowl. Gradually rub in the butter. (An electric mixer can be used for this recipe. )Once the butter and flour mixture is thoroughly combined, add the mashed potato and the milk (a little at a time) then mix together to form a soft, but not sloppy, dough. Roll out your dough on a lightly floured surface and cut into 10 rounds with a pastry cutter. Ideally, the potato cakes will measure between 5 and 7.5cm across. They can now be sprinkled with caraway seeds if you wish and cooked on a floured baking tray in the oven-for fifteen to twenty minutes. Alternatively, heat a knob of dripping in a frying pan and fry the potato cakes until browned on the outside.Drain and serve the cakes with your chosen dish. Cheese potato cakes make tasty accompaniments to cold meat dishes, haddock or mixed bean salads. 25g grated Cheddar cheese (or any hard cheese that has a ‘bite’). Mix all the ingredients together-either with a wooden spoon and mixing bowl, or, in an electric mixer.Heat a frying pan with a knob of dripping in it, or use a greased griddle. If using a hot griddle, drop spoonfuls of the mixture onto it and turn the cakes over once to brown them on both sides. This takes about 3-4 minutes each side.If baking in a pre-heated oven, follow the same guidelines as in the previous method. Finely chopped cabbage can be added to the basic dough-the resulting potato cakes are not dissimilar to bubble and squeak.A tablespoonful of cooked diced bacon, finely grated onion, chopped leek, mushrooms, tomato, or apple, puree make tasty alternative flavours to the basic dough and lend themselves as accompaniments to a greater variation of dishes.Add some crushed garlic or mixed herbs for a change, too, if you fancy! Mixed with apple puree, the potato cakes taste great with pork chops or sausages.Chopped leek or onion added to the mixture complements cuts of lamb and cold chicken very well.Mushroom potato cakes go well with a steak and salad. Mixed with onion and tomato puree, the potato cakes are good with homemade burgers.Wholemeal flour can be used in the mixture instead-or try them with oatmeal now and then.As always-use the recipe as a guide to get started on something new-then adapt it to suit your taste and create your own versions!Cheap, uncomplicated and not time-consuming, enjoy your tatties!